Hayes & Yeading United stretched their unbeaten run to nine games this afternoon when goals early in the second half saw United come from a goal behind to win an eighth game in a row at Weston-super-Mare. The Seagulls despite being decimated by injuries started the livelier of the two sides and twice in the first 20 minutes went close to opening the scoring. 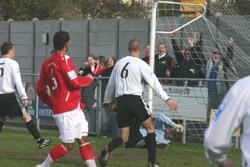 The first chance fell to Marvin Brown who met a low near post Scott Partridge cross but could not divert the ball into the United net. Partridge was also involved in the second chance which saw Matt Groves receive his knock down with his back to goal, his shot on the turn going across goal and wide of the far post. It was the 24th minute before Ryan Northmore was threatened in the Seagulls goal, Dale Binns took a quick corner to Will Hendry who slipped past his marker and fired for the near post only to be denied by Northmore who touched the ball wide of the upright. The follow up corner was taken by Hendry, Steven Gregory neatly flicked on at the near post but the ball just evaded Scott Fitzgerald's slide at the far post and went out of play. Minutes later United were again on the attack, Gary MacDonald played the ball forwards for Fitzgerald to chase, Northmore raced from his area to head out as far as Hendry who tried his luck from distance but was wide of the target with the keeper stranded. The Seagulls then hit the visitors with a debut goal from defender Tom Evans. A free-kick was pumped forwards into the United box, having let it bounce, the defence also allowed Charlie Comyn-Platt a touch that took the ball to his defensive partner who hooked it past Preddie into the roof of the net. Weston immediately went for the jugular with a long throw being flicked on the Ben Wells who hit a dipping volley from all of 30 yards that Preddie was glad to see drift wide of his far post. 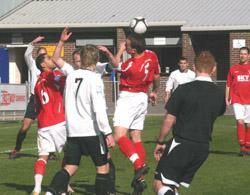 As the half came to a close United came close to an equaliser on two occasions. Gregory tried a long range drive that Northmore did well to palm away with Tom Parrinello tidying up and then right on the whistle Hendry and Fitzgerald played a neat one-two that resulted in a Hendry chip shot that caught Northmore too far off his line, sadly the ball dropped just inches over the crossbar. Having finished the half on the attack, United started in the same vein in the second and the equaliser came courtesy of Staforde Palmer in the 47th minute as his cross from the right sailed on the wind and beat Northmore into the top corner of the Seagulls net (below right). Just four minutes later the ball was again in the back of Northmore's net. A Binns corner resulted in a scramble at the far post that saw referee Swabey point to the spot, it would appear for handball. In the absence of the suspended Josh Scott, Hendry stepped up only to see his kick palmed out by Northmore. Palmer was quickest to the ball, his shot appeared to be off target before Fitzgerald got a touch that beat Northmore to give United the lead. Having taken the lead just six minutes into the half I really ended with very little else to write about, Comyn-Platt was extremely lucky to have seen yellow and not red just before United's second goal when he kicked Fitzgerald who was already dumped on the ground. Just after the hour mark Preddie had to make his solitary save of the half when he kept out a Partridge effort at the foot of his post. Other than that, Northmore had to stretch to tip over a Binns corner for United and at the other end Adie Harris fired over with a free-kick from just outside the area.